There's always those days when you are running behind and don't have time to make an elaborate lunch for your kiddos. 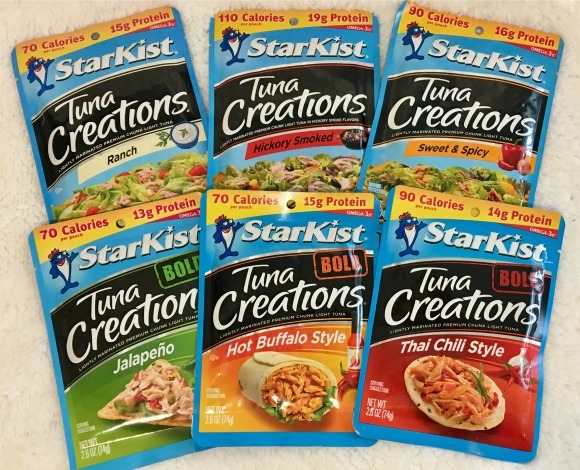 But no one has to know it when you have StarKist Tuna Creations in your pantry. They are handy packets of flavored tuna ready for making sandwiches, wraps, or toppers for salads and more. They come in perfect portion sized individual packets that make lunch making a breeze. No need to drain them either because they aren't in liquid like the canned version. That makes them great for enjoying on the go too. Sometimes my daughter likes to make her sandwich after she gets to school so the bread doesn't get soggy. These are perfect for that because they have a notch at the top for ripping it open and then you just squeeze it right out onto the bread. They're also great for my husband to keep in his locker at work with a package of crackers for those times he accidentally forgets his lunch at home. They come in an assortment of classic flavors like ranch and lemon & herb as well as their new Bold flavors like hot buffalo style and jalapeno. That makes them great for satisfying everyone's taste buds. With 10 great flavors to choose from and it’s no drain, no mixing required, it’s hard to find a reason not to pack them up!